The DVR is a great addition to any of our backup camera products. Its got a very easy to use GUI that you can configure in a matter of minutes. It also has a built in monitor for viewing which makes this a great all-in-one unit, an external monitor may also be used. You can connect up to 4 cameras so this DVR will record just about everything around you. You can use a push button to start it or it has an auto start. A maximum recording rate of 120 frames per second (FPS), H.264 video encoding which uses up to 50% less storage space than Mpeg4 encoding. This allows you to have one month of recording time. You can view this directly on the machine or export it to a computer. The machine runs on a simple 12V so any power source in the car will work. The DVR records onto an SD card. You can put 2 SD cards in the DVR at a time. So you can record on one and pull out the other. It is very easy to get the information over to a computer, simply pull out the card and take it to a computer. You can also lock the DVR closed to protect the SD card. This Mobile DVR for any vehicle is compatible with ALL our cameras it is just a simple connection. You can always feel safe too as the DVR locks and only you have the key. Its also shock resistant which makes it great for any vehicle from a Taxi to a Tow Truck. Its very easy to set up. You can record anything you want, from your cars to your children. It will record everything your mobile DVR camera system sees and it will retain that information for you. The ultimate safety net! The premium side camera has a 120° Degree viewable angle, its waterproof and has auto night vision. It also swivels so you can point it in the best spot possible. The side camera is perfect for any long RV or Bus. You can mount it on the side facing front or back any see everything in crystal clear quality. Do you need help parking? This is for you! Do you need help changing lanes on the freeway? This is a must! 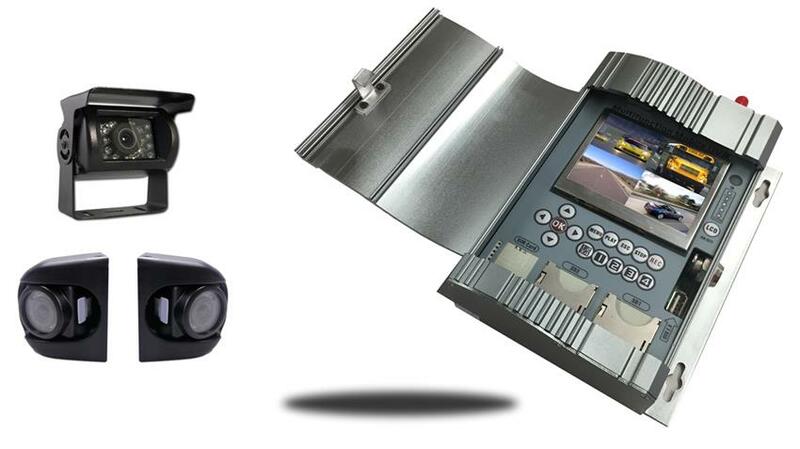 The RV Box camera Has a 120° Degree viewable angle, its waterproof and has auto night vision. The camera is one of the most durable we have, with incredible adjustability and night vision clarity. The RV Box camera has a metal sun shield visor to protect you from glare and pebbles. This is by far our toughest built camera. It has been regularly used in cars, vans, buses and even industrial sized caterpillar trucks, operated in the harsh oil sand of Canada. This camera can take a direct hit from a rock and it will still work like new. It has also been very popular with RVs because its housing allows you to install the cameras on multiple sides of your RV. SD Card is the way to go! "We added this DVR to our Ultimate RV system that we purchased 2 years earlier and we were amazed how much peace of mid it gave us. When we park our camper and leave it for a few hours we know exactly what has been going around while we were gone. it was easy to set up and the techs at Tadibrothers helps us split the image off to 3 other screen on our camper and they did it wirelessly! Good product and even better service all around 2 thumb up for the Bros!" "The camera looks good on my 35ft RV. I follower the instructions and it was easy to install." "Bought this as part of a wired ultimate system from them and I'm very happy with the premium side cams in particular. The picture quality is just so much better than my old system. Also installation wasn't bad for a wired one!" "I needed a standard camera that will fit on 3 of my vehicles that i use to farm. This camera fit the bill. its birds eye view gives me the perspective i need and i love the night vision. So far i have purchased 3 of these and my son in law has 9. We are both satisfied with the rear view camera"